In her book, The Birth to Five Book, Brenda Nixon discusses how to feed a finicky toddler. Below is the first part of her essay on finicky eaters. Got a toddler who’s shy about new foods? Are you struggling to get [a] young one to eat nutritious meals? Testy toddlers can have timid taste buds. And by the time they’re two, no is a favorite word. One study shows that boys tend to be fussier than girls about new foods. Avoid stressing out about feeding your toddler. Keep mealtimes social and relaxed. 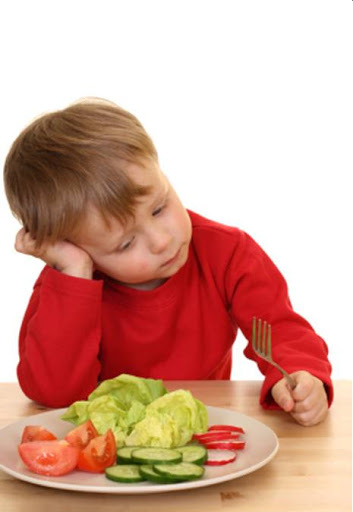 If [the] tot refuses something, don’t force, cajole, or say, “Sit there till you eat!” These negative stigmas on eating make meals a battleground with food as the weapon and can usher in eating disorders. Many well-intentioned parents make the mistake of running back to the kitchen for a different dish if their child turns up his nose. The better way to handle this situation is to prepare and serve tiny portions frequently along with favorite foods. Just the familiarity of the rejected food makes it less intimidating and more enticing to a toddler’s curiosity. It can take up to 15 times for a child to accept the new food. However, when he samples something of his own accord, chances are he’ll be open to trying other new foods. Also, be a good role model. Sit with [the] toddler and nibble new foods yourself. As [the] tot watches you, he’s gently nudged to try new dishes. Start early offering food variety; it’s easier to get a one-year-old than a two-year-old to try a strange dish. By the time I was 17, it was too late for me to sample the new dish. Grandma prepared – cow’s tongue. Another great artcile by Andrea Flagg can be found on the Regarding Nannies blog about finicky eaters. Stop by again tomorrow for more from Brenda Nixon about Feeding Finicky Toddlers. « Too Many Sweets and Junk Foods? Do not let foods touch on the plate! Only serve healthy food for snacks and you won't need to worry about getting in healthy diet for children. But once in school the children will need to learn to follow an eating schedule. The little girl I work for won't eat and it's frustrating. I think she's playing a game though. She gets a lot of attention for not eating and piles up on junk food. Grandma and mom just talk about it all the time how she won't eat. She is tiny but doctor unconcerned and she does take a prescribed vitamin. It's a game, she gets a lot of attention for not eating. One of the children I care for manipulates with food. She gets so much attention for not eating. She eats plenty of cookies and chocolate but not much else at her house. When we visit others she eats healthy. She gets so much negative attention I think it is manipulation. I can't fathom how bad it'll be when she's a teen.